Own Lego Ninjago - Masters Of Spinjitzu Season 1 DVD from Deff, DVD, Blu-Ray & 4K Video Specialists - Free UK Delivery..
ONE NINJA MUST TRAIN TO SAVE THEIR WORLD The great Devourer has been defeated, but Lord Garmadon is still at large and what's worse - he now holds the four Golden Weapons of Spinjitzu, and soon he commands both the Serpentine and the Ninjas’ flying ship 'The Bounty'. The four Ninja must train Lloyd for his confrontation with his father, but with limited powers and without a home, it proves more difficult than they could have imagined. A..
Own Lego Ninjago - Masters Of Spinjitzu Season 3 - Part 2 DVD from Deff, DVD, Blu-Ray & 4K Video Specialists - Free UK Delivery.. In the battle for Ninjago City, Lloyd (Dave Franco), high school student by day and Green Ninja by night, gets thrown into the ultimate adventure with his secret ninja warrior friends! Led by the wise and wisecracking Master Wu (Jackie Chan), they must defeat evil warlord Garmadon (Justin Theroux), The Worst Guy Ever, who also happens to be Lloyd’s dad. On their courageous journey, they learn to band together to unleash their inner powe..
Own The Lego Ninjago Movie DVD from Deff, DVD, Blu-Ray & 4K Video Specialists - Free UK Delivery.. While Cole battles for his freedom, the Ninja must return their ghostly foes to the Departed Realm before they gain the power to remain in Ninjago forever!.. Own Lego Ninjago - Hands Of Time DVD from Deff, DVD, Blu-Ray & 4K Video Specialists - Free UK Delivery..
Own Lego Ninjago - Masters Of Spinjitzu - Possession DVD from Deff, DVD, Blu-Ray & 4K Video Specialists - Free UK Delivery.. The world of Ninjago is in terrible danger. An army of skeletons has invaded from the underworld, under the command of the evil Lord Garmadon. Their goal: capture the Four Weapons of Spinjitzu, artifacts so powerful it is said no one being can wield them all at once. Now Garmadon's brother, the heroic Sensi Wu, must gather four young men and train them in the ways of the ancient art of Spinjitzu. These four - Kai, Jay, Zane and Cole - m..
LEGO Ninjago: Masters of Spinjitzu Season One: Four Heroes Prepare to Face a New Enemy…Join a new team to save the world in Season One of Lego Ninjago: Masters of Spinjitzu. 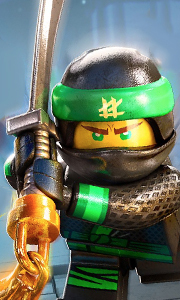 Ninja heroes Kai, Jay, Zane and Cole take on Lloyd Garmadon, the son of their archenemy, who has released sinister snake tribes in his attempt to conquer the land of Ninjago. But Garmadon’s evil plan goes awry when he lo ses control and becomes a prisoner to the sna..
Own Lego Ninjago - Masters Of Spinjitzu Season 2 DVD from Deff, DVD, Blu-Ray & 4K Video Specialists - Free UK Delivery.. Victory in the Final Battle between the Gold Ninja and the Overlord has ushered in a new era of peace and begun a technological renaissance. Time has passed and the Ninja have become obsolete in this new hi-tech world. Just when they think all is safe in Ninjago, they’re called back into action when the reclusive inventor Cyrus Borg warns them the Overlord has survived as a digital virus and is trapped within the Digiverse. The Ninja wi..
Own Lego Ninjago - Masters Of Spinjitzu Season 3 DVD from Deff, DVD, Blu-Ray & 4K Video Specialists - Free UK Delivery..
Own Lego Ninjago - Masters Of Spinjitzu Season 4 - Part 2 DVD from Deff, DVD, Blu-Ray & 4K Video Specialists - Free UK Delivery..
Own Lego Ninjago - Masters Of Spinjitzu Season 4 DVD from Deff, DVD, Blu-Ray & 4K Video Specialists - Free UK Delivery..
Own Lego Ninjago - Masters Of Spinjitzu Season 5 DVD from Deff, DVD, Blu-Ray & 4K Video Specialists - Free UK Delivery..
Own The Lego Ninjago Movie 3D Blu-Ray from Deff, DVD, Blu-Ray & 4K Video Specialists - Free UK Delivery..